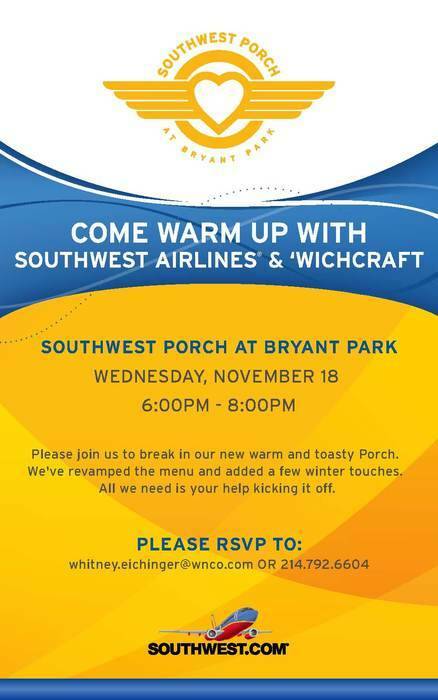 Southwest Airlines, ‘wichcraft, and Bryant Park Corporation are pleased to invite you to the winter re-opening of the Southwest Porch at Bryant Park, this Wednesday, November 18, from 6pm to 8pm. On top of the free WiFi, power outlets, and lounge-like seating the Porch is known for, we’ve made some changes to the menu, added heaters and a fire pit, and have some stylish winter accessories to help you stay comfortable in the cold weather months. RSVP to whitney.eichinger@wnco.com or (214) 792-6604, then visit the park and experience winter at the Porch.